Fancy a vacation in paradise where you can dive from your room into the deep blue ocean or majestic lake? 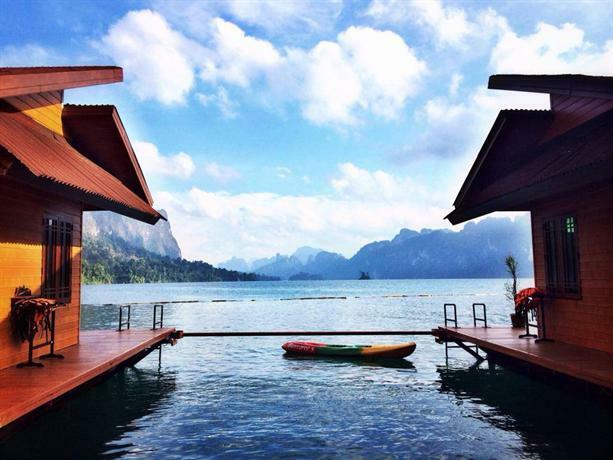 You won’t want to miss these gorgeous overwater bungalows in Asia! This is the most comprehensive list of overwater bungalows in Asia, from the Maldives to Indonesia and beyond. 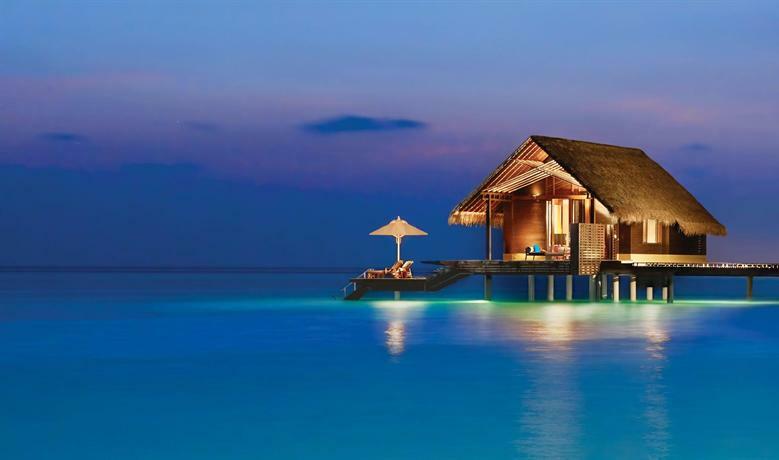 Although the Island of Gods is not known for its overwater villas, it is famous for the many luxury hotels. Look closely and you will find a few semi-overwater bungalows in Bali to satisfy your Maldives dreams. Let’s kick off our list of the best overwater bungalows in Asia with something a little different. 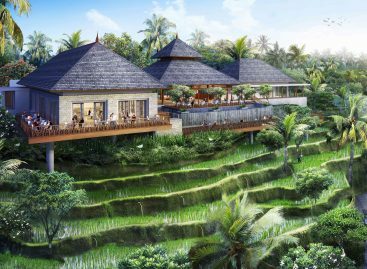 While we usually associate stilted villas with the ocean, there are a variety of other options, most noticeably amid lush dense rainforest over natural ponds. One such example are the restored Javanese teak wood bridal homes at the opulent and eco-conscious Bambu Indah in spiritual Ubud. The elevated houses are set in an intimate, comfortable, natural setting that ooze rustic chic. Bespoke experiences are also on offer from Balinese blessings to village hikes. Will also look at writing one or two sentence intros to each country and why they would stay at each. 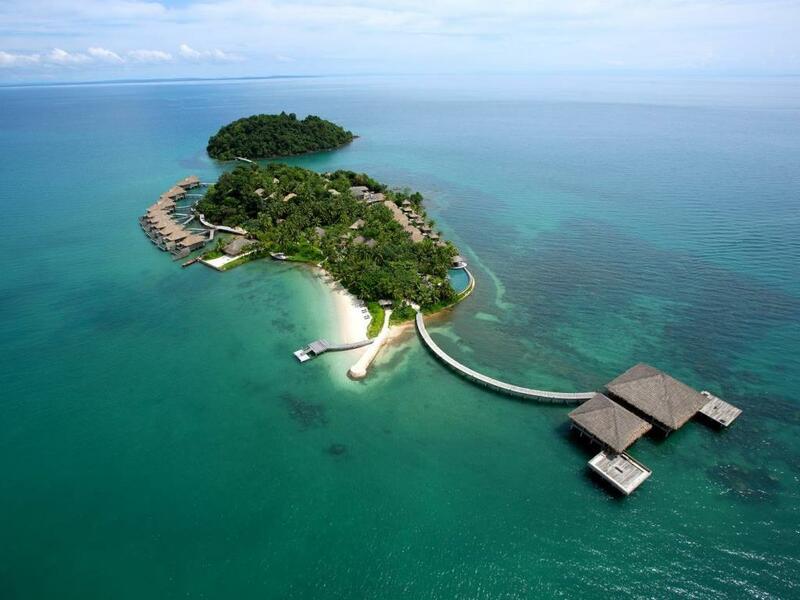 The newly opened private island is one of Indonesia’s most exclusive getaways. There are beach and overwater villas where you can dive straight into the crystal clear waters below. The food is made to order at every meal, where you will actually speak to the chef who will design your meal for you. It is an all-inclusive getaway meaning that everything will be included other than alcohol, no tricks or funny surprises. That means bottomless massages at their spa! There are also land and water based activities to keep you busy for well over a week. Check Online Specials and more photos | on their website. 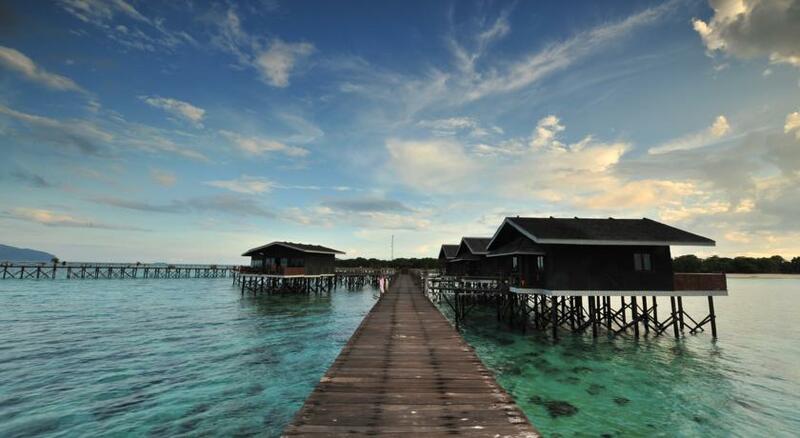 Tucked away in the Riau Islands of Indonesia, Telunas Resorts offers a getaway of your dreams. Experience a healing vacation away from the stresses of the city on their private island or in their beach resort on Sugi Island, a ferry ride from Batam. With their facilities built entirely over the crystal clear waters, enjoy your stay at one of their villas surrounded by the jungle and the sea. If you’re lucky, you might even catch sight of wildlife like sea otters and pink dolphins. If you’re thinking of heading to Indonesia make sure you save one of our many itineraries. 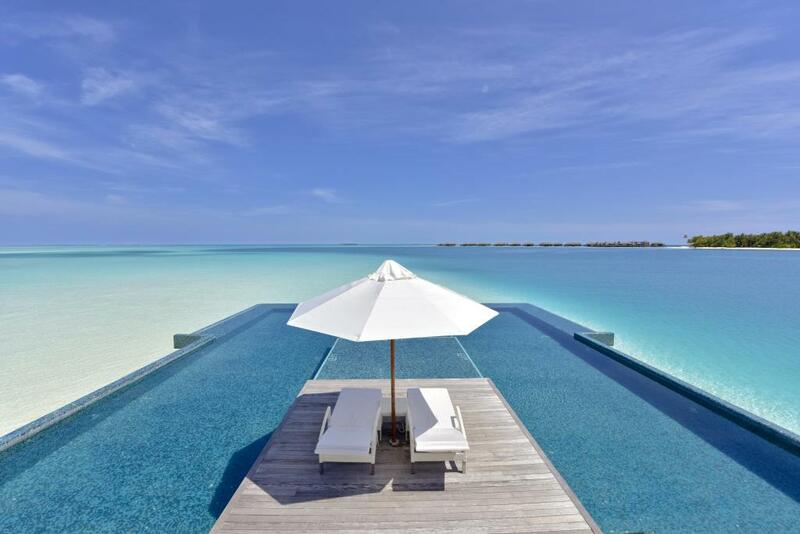 Check Online Specials and more photos | HotelsCombined | Website for the private island. 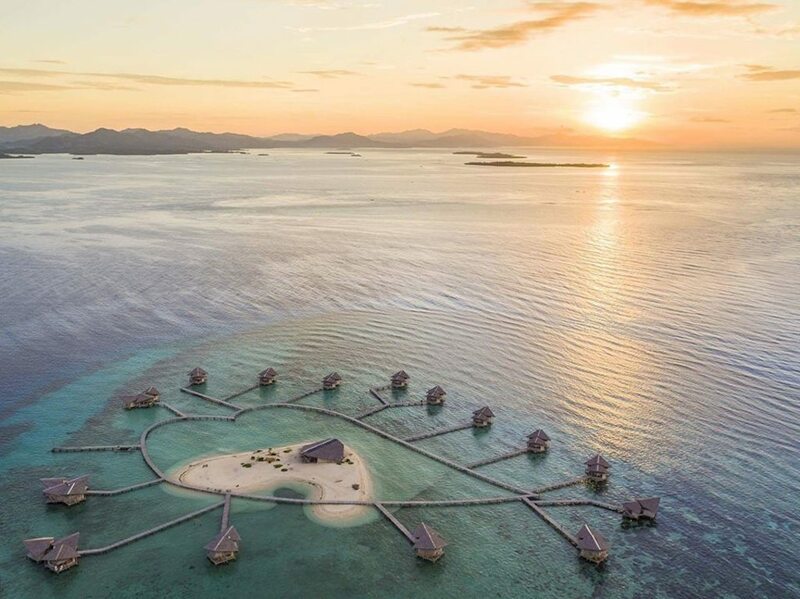 From an aerial view, Pulo Cinta’s villas are connected in a heart shape, reflecting the island’s history as a secret romantic escape for a pair of star crossed lovers during wartime. Today, you can book a stay at their romantic resort with your loved one, and spend quality time under the stars. And if you’re seeking some adventure, the islands of Boalemo and the Tomini Gulf offer exotic aquatic biodiversity and lush forests. Read this article for another romantic Indonesian escape to the Gili Islands. This is a truly off-the-grid location for those explorers looking to take a digital detox. While the wifi is non-existent, the view from the water cottages is one of the most spectacular you will witness. As this is a true eco-resort, everything is left to the elements, so you will not find luxuries like air conditioning. This is the place to relax with a book, swim in the clear blue ocean and watch the gorgeous scenery pass you by. You can also arrange guides from the resort to go on endless excursions. 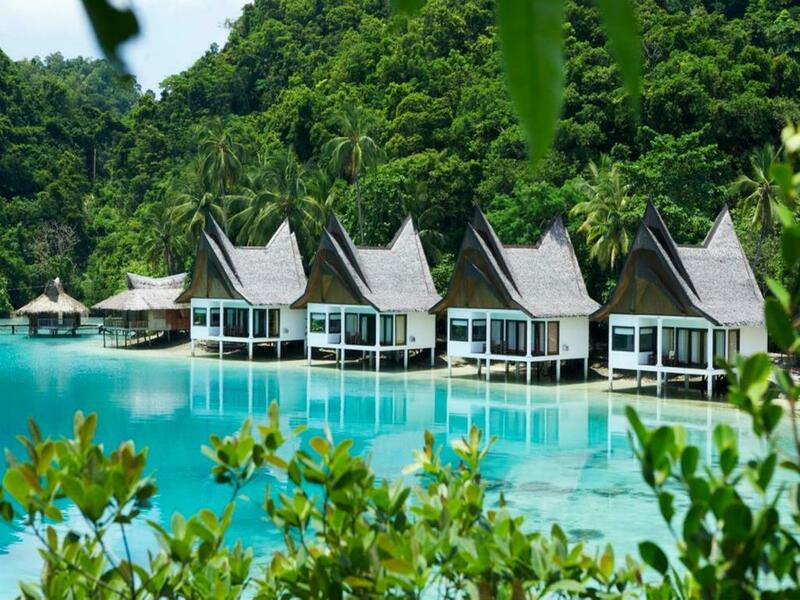 The tropical hideaway of Misool Eco Resort is located on one of the remote, uninhabited islands of Raja Ampat in Indonesia, known for its breathtaking and otherworldly beauty. You will be one of only 40 guests on the island and with a staff-to-guest ratio of 4:1 you can expect world class service. Picture the perfect image of white-sand beaches and azure ocean covering tropical corals and you know you’re imagining Misool. Dive in from your stilted room into a world of biodiversity like no other. 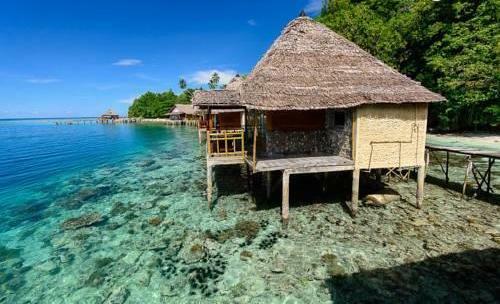 Similar to Misool, Papua Paradise is located in the beautiful Raja Ampat Islands. So divers can expect a bustling marine life. If you take a look on TripAdvisor, you’ll see rave reviews of the eco resort. From the friendliest staff to knowledgeable guides to delicious food. The standard bungalows will already exceed your expectations. Yet if you want true high-end, opt for the deluxe bungalows. 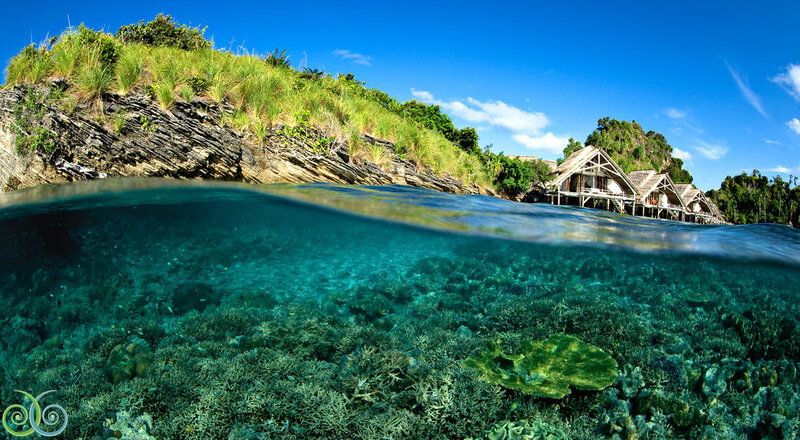 Read more on this review of the Papua Paradise Eco Resort. Yet another resort with the word “paradise” in its title that will surely to live up to its name. Just off the coast of East Kalimantan, Borneo in the Derawan Archipelago, Maratua is perfect for a long weekend getaway. 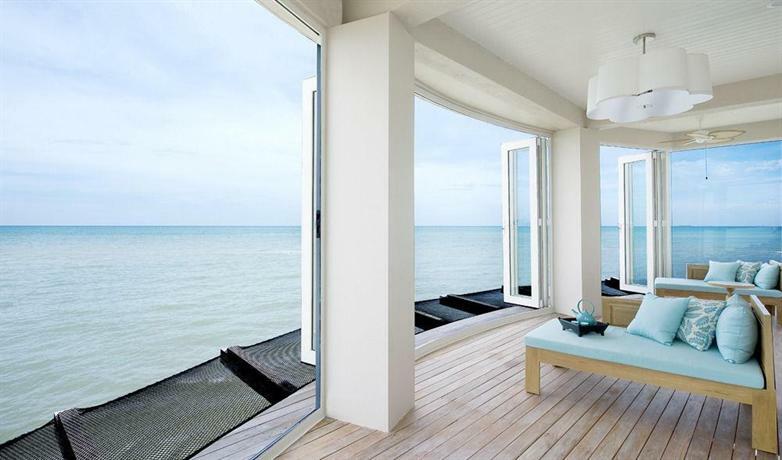 All bungalows have a terrace with a sea view. While resting on your overwater villa, look down to see an abundant marine life. You don’t even need to get in the water to witness the spectacle of nature. Palau Ayer is the perfect escape for business people visiting Jakarta. It’s only a 20 minute boat ride from Marina Ancol. 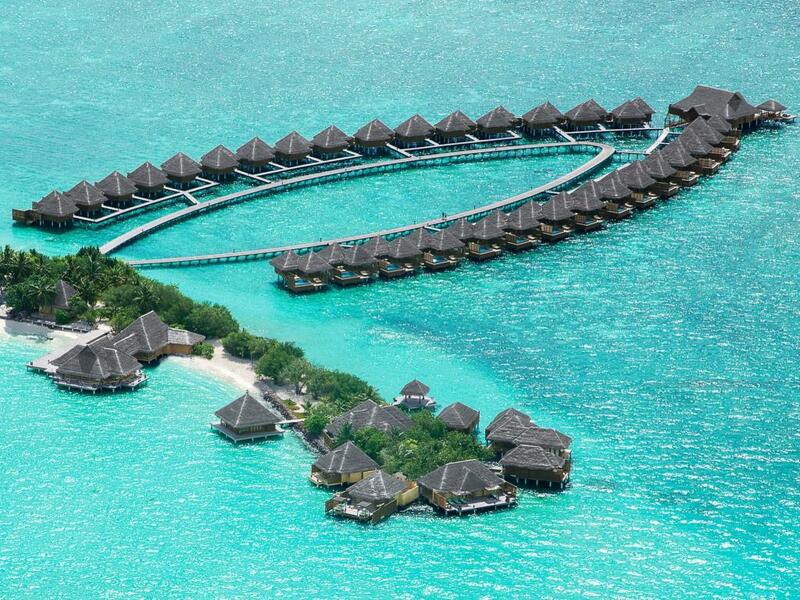 They call their overwater bungalows “floating cottages” which is not an understatement. It has more of a resort feel due to the large number of huts, but you can also expect all the amenities that a normal land resort has to offer. Except now you have your own private balcony to watch life go by. 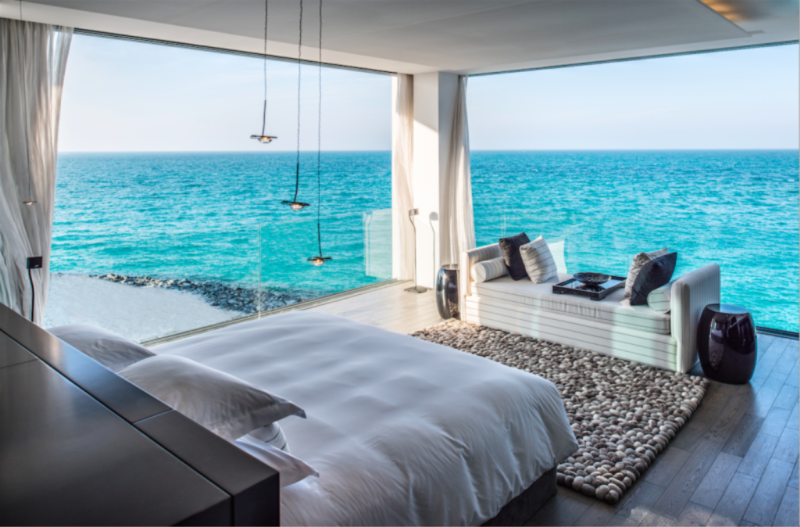 While technically not an overwater villa, the rooms are ocean-facing and high up of stilts. So you won’t necessarily be able to jump right in from your room, but you will be able to jump in your pool while looking out into the azure sea. The villas are large, with enough space to have a dance. The bathrooms are also really impressive with sunken sea view bathtubs. It’s the perfect stay for a private and rewarding time with your loved ones. 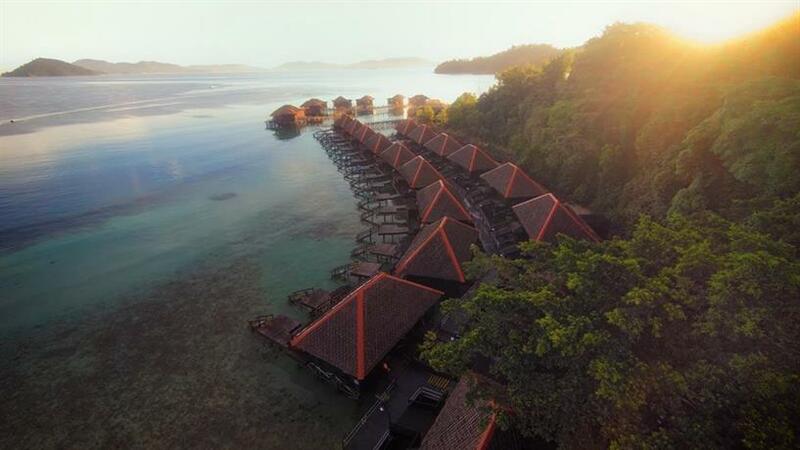 Nestled on a remote private island in the Sulu Sea, this luxuriously chic resort has stilted rooms as well as those with direct beach access. Not only are some of the rooms over the water, but the spa boasts a glass floor where you can watch the fishes go by while the masseuse unties those knots. There are Italian and poolside dining options as well with the wine and cheese bar located directly on the beach sand. 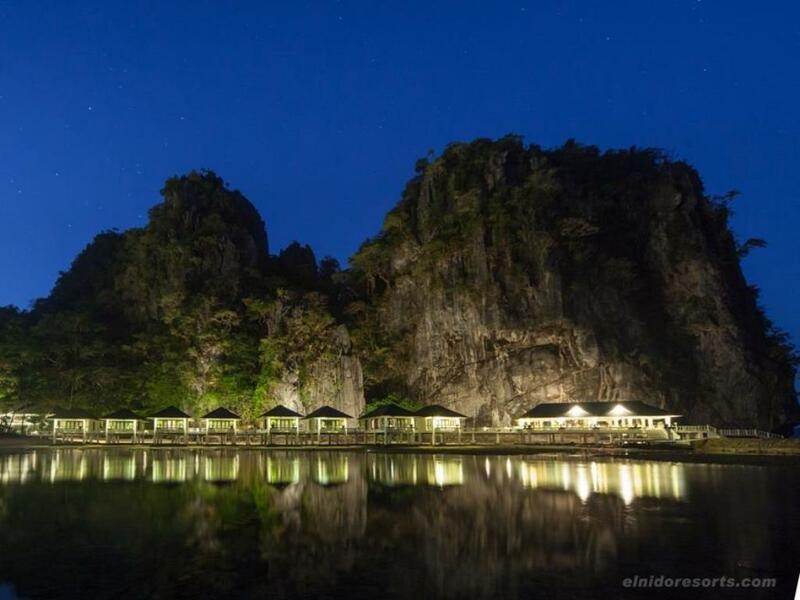 El Nido is situated in a cove of the mountainous Apulit Island in Taytay Bay in North-eastern Palawan. Thrill-seekers will love climbing and rappelling down the 60-meter limestone cliff or exploring the Japanese shipwrecks just of the coast. You can even go spelunking! The best part is that there is an activities coordinator who can help to plan your entire trip. 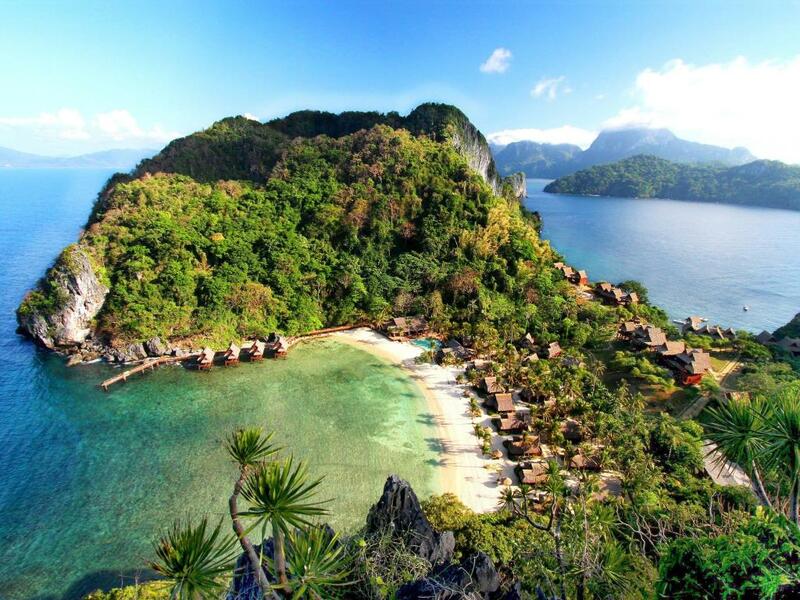 Another El Nido property, the Lagen Island wing offers a more relaxed stay among the tropical foliage. 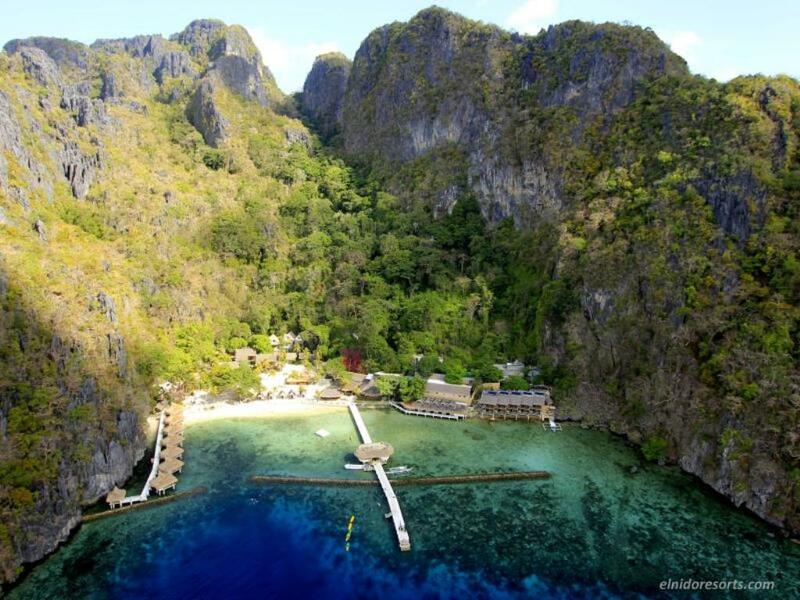 In fact, it boasts the densest forest in all of the 45 islands that make up the Philippines. Animal lovers will enjoy gazing at the endemic species that flourish throughout the natural habitat. Forest suites are also available if you’d like to be closer to the trees. This is the only of the El Nido Resorts in the karst lime rocky area that has its own pool, for when you want an alternative to salty water. The pool is shared with guests from sister property Miniloc. It’s time to treat yourself. And the best way to do that is to stay at what is probably the most luxurious of the El Nido resorts, Pangulasian Island in Bacuit Bay. Expect rooms with infinity pools that overlook the ocean, with the cutting edge of “green” and sustainable design. There are 42 accomodations to choose from. Pick to your taste from the beach to canopy villas. 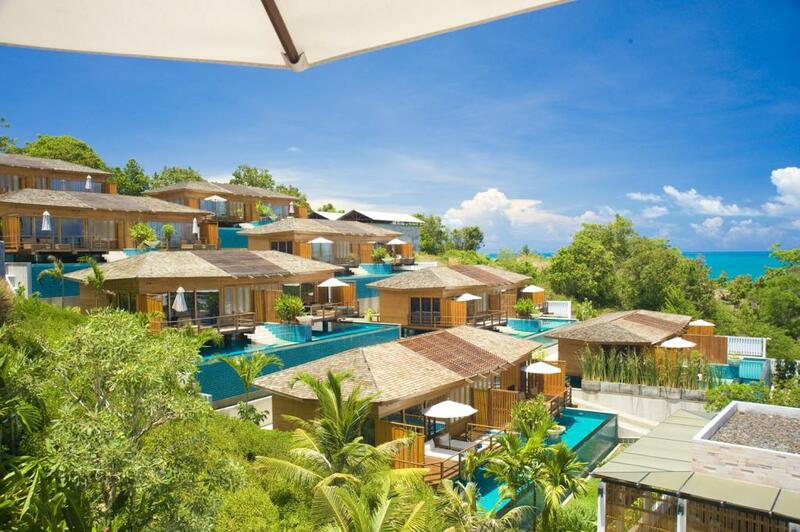 Families will want to book the four Kalaw Villas where secluded dinners can be had. Read our complete itinerary for Pangulasian Island here. 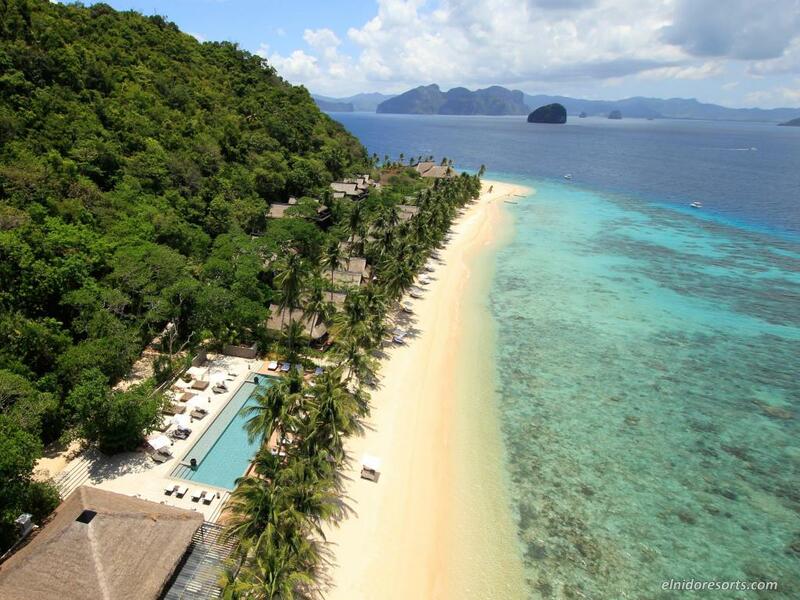 The fourth option in the El Nido Resorts chain, offering a Filipino coastal retreat in a rustic setting. It’s a place for amphibious adventures and located close to some popular attractions around Bacuit Bay, like the Big and Small Lagoons and Snake Island. The thatched roof overwater villas are made using all indigenous and local materials. Guests staying at Miniloc have access to Lagen facilities and its pool. 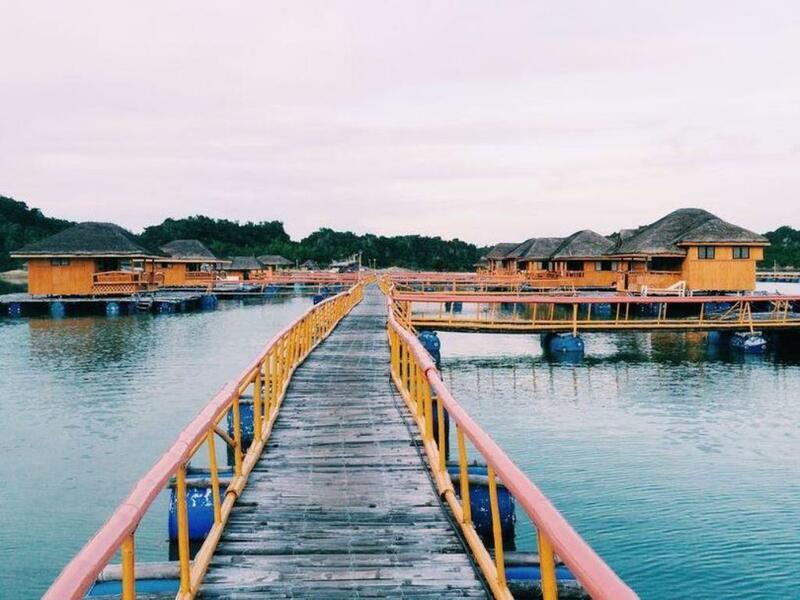 Located on the second largest island of the Philippines, Mindanao, and close to Davao city, this gem of a resort is away from the hustle and bustle of city life. Selected as a top pick by travelers on TripAdvisor, you’ll be greeted with sand beneath your feet, and stilted lodgings for your dose of luxury. Not only is Pearl Farm the only 5-star resort in Mindanao, it is also dosed with history and culture of the ethnic Mindanao tribes. Read out itinerary for Davao, also known as Durian City, here. The ambience at Club Tara is soothing as each overwater room has its own lanai (terrace), looking the tranquil ocean. Every room also comes standard with a jacuzzi, air-conditioning and other modern amenities. You can take a kayak to some of the other islets in the Surigao del Norte area. It’s perfect for honeymooners who want some alone time among the romantic scenery and powder white beaches. The floating huts at Grace are quite distinctive as they’re modeled to represent the traditional Bahay kubo (Nipa huts) of the area. There are only 8 floating cottages available so you are guaranteed peace and quiet with only the sound of lapping waves to keep you company. You will need to take a 60 minute boat ride to reach your destination, but if you don’t get easily seasick, the reward is a truly isolated slice of paradise. 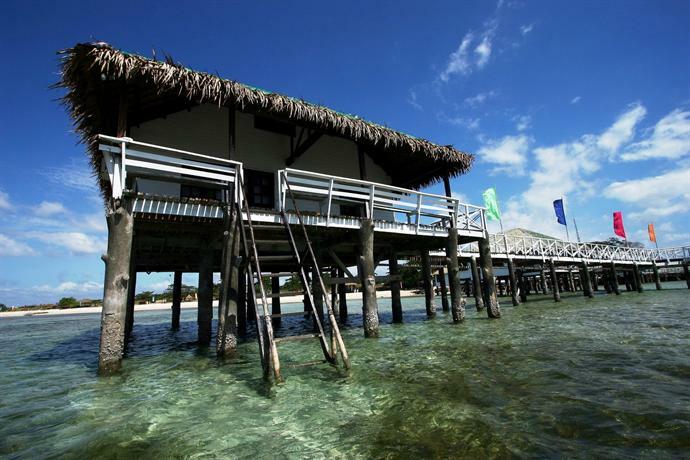 Companies looking for a bit of a different team-building experience can reserve a spot at Stilts Calatagan. The resort caters for all types from corporate events to special occasions or the simple weekend getaway. Their “everything is possible” philosophy is sure to make your every wish come true. Amazing Race anyone? The duplex styled floating cottages are also a bonus for families. 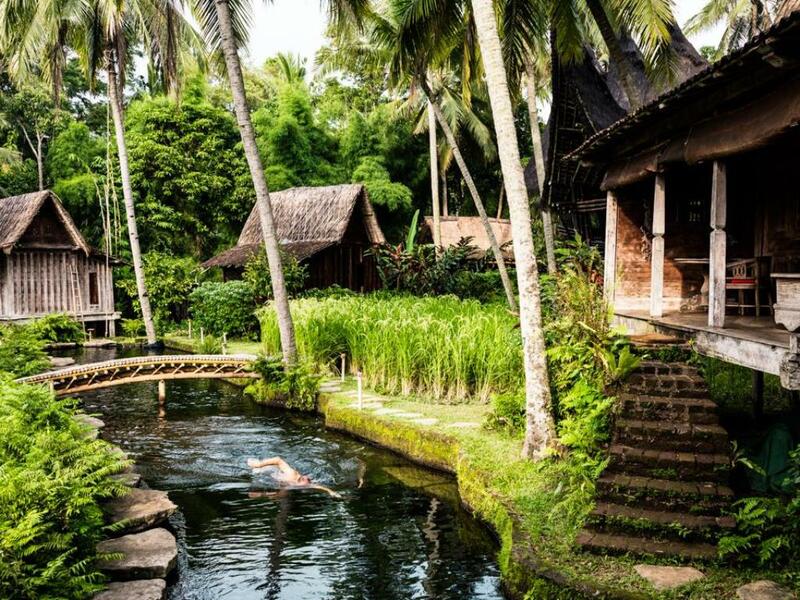 How about a stay in the middle of a working coconut plantation? And if waking up to fresh coconut milk isn’t enough, the also have the largest private antiquity collection in the Philippines, bamboo rafting and the entertaining Labasin Waterfalls Restaurant. Yup, you eat below a waterfall! As the focus at Villa Escudero is on heritage, you will also witness native dance performances and a visit to the Escudero Private Museum. Rooms come in a choice of air-conditioned and non-air-conditioned. You don’t get more luxe than a marble tub in your overwater villa. Cauayan Resort is based in El Nido, so you won’t be short of white sand beaches, a diverse array of flora and fauna and water activities in the crystal blue ocean. Wake up in the morning and dive right into the ocean with perfect panoramic views of the beautiful cliffs. 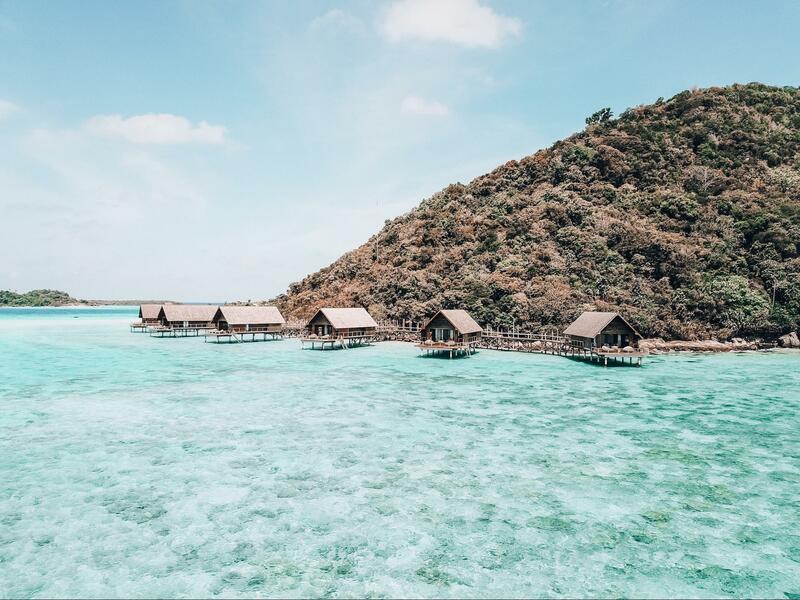 The Middle East is technically part of Asia and can definitely be a comfortable weekend getaway, so check out these fabulous overwater bungalows in Dubai and Abu Dhabi. Situated over the waters of the Arabian Gulf, The Palm Dubai is a luxurious vacation spot that’s the first of its kind in the Middle East. Wake up to the sound of the waves, get a breakfast in bed, and admire the waters directly through the glass panel on the floor. Don’t miss chilling at the infinity pool, setting foot on the soft sand, and having a private dining experience on the villa deck. Zaya Nurai is a resort like no other. The rooms are beyond spacious and will make your home feel like a hole. From the bose sound systems to the Moltom Brown bath products, you can expect surprise after surprise as soon as you step into your villa. The beach villas along the main beach strip are covered in glass walls and filled with king-sized beds. Choose from one of three restaurants after your relaxing spa, while the kids are entertained at the kids’ club that includes features like ziplines and a climbing wall. The Conrad Rangali is luxe like no other. 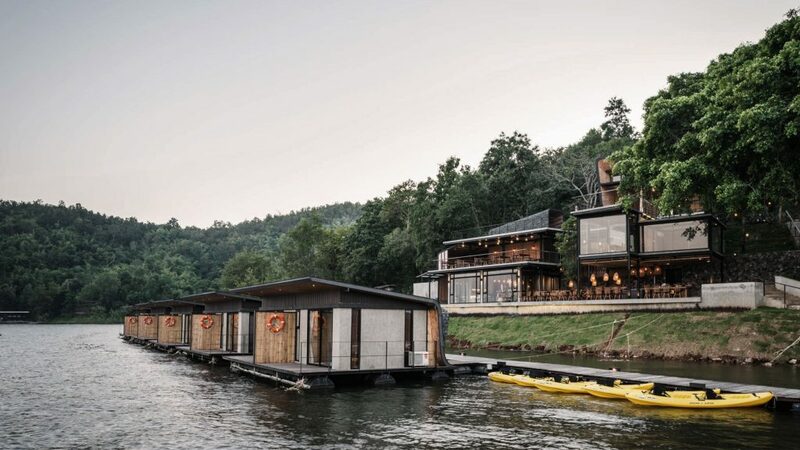 Not only can you sleep on top of the water, but you can even dine underneath it! That’s right, you can have your dinner while watching sharks swim overhead, like a natural aquarium. But this isn’t the only reason why you’d want to stay at the Conrad. The overwater villas even have outdoor Jacuzzis. The price tag is high, but if you can then why not stay at one of the best hotels in the Maldives. Here’s a review to get you inspired. With villas ranging in size from the already large 235sqm to the extravagant 5540sqm Private Reserve that includes everything from a children’s bedroom, private pool and water slide, to a spa, sauna, steam room, and fitness room. 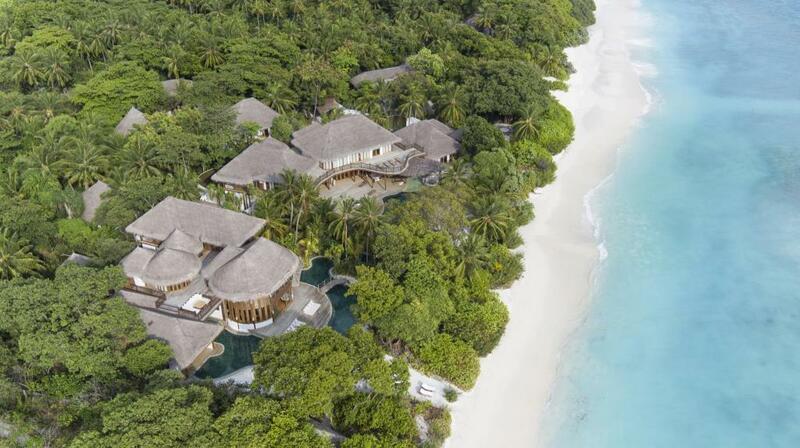 Soneva Fushi is more than luxury, it’s a celebrity paradise where you can live like the rich and famous. The surrounding areas of the island of Kunfunadhoo in Baa Atoll are lush and thriving with beauty. Cocoa COMO offers complete relaxation with its Shambhala Retreat where weary souls can renew their body and mind. The rooms are gorgeous and inspired by local dhoni boats that are decked in bleached wood with kajan roofs. The restaurant only sources local seafood with organic vegetables to give an extra dose of healthy living. The One&Only Reethi Rah is a secluded oasis in the North Male Atol. Unlike many overwater villas that face each other, the One&Only offers exclusive and unprecedented privacy. All you will hear in your villa is the sound of nature and the ocean. You’ll also be transferred in style, either on a speedboat or their private 55 Ft luxury yacht. The beautifully laid out villas of the Taj Exotica gives a fantastic first impression. If you’re going for uber luxury, then you should definitely reserve one of the suites. Ochre and beige tones will have you instantly in that holiday vibe and the attached spa downstairs will make you never want to leave your room. 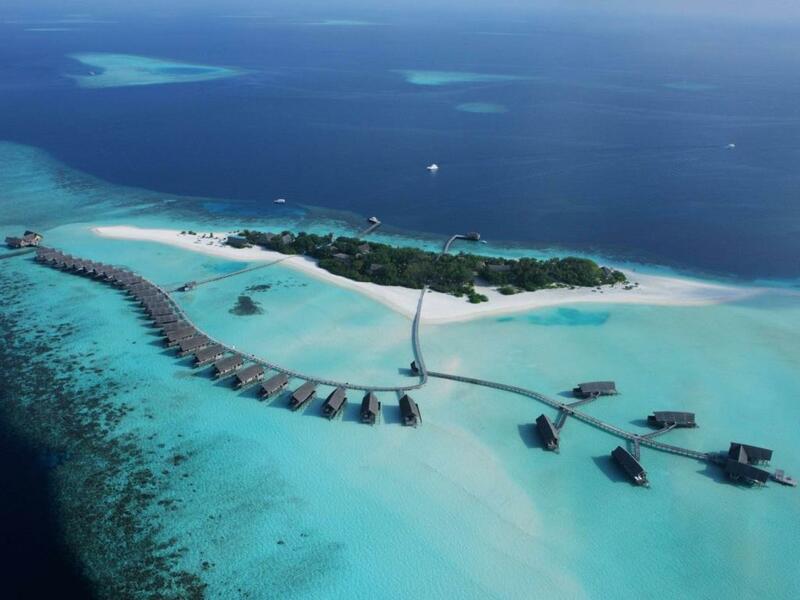 Reethi has two options available for overwater villa luxury. 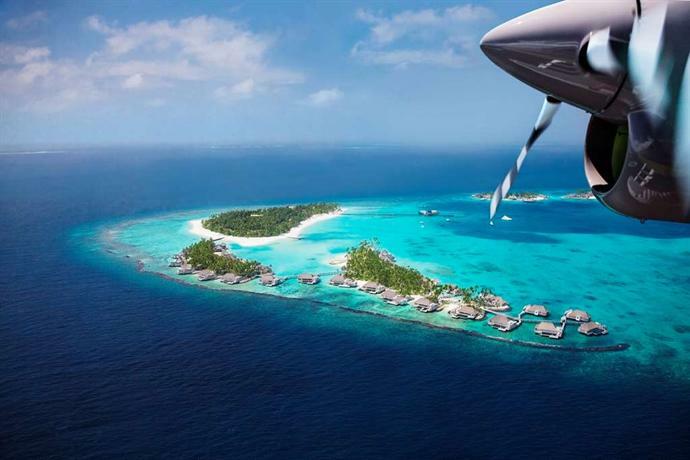 The first is Reethi Beach Resort which is located on the tiny Baa Atoll, a 35-minute seaplane flight from Male. The villas are built using local materials and are spacious. 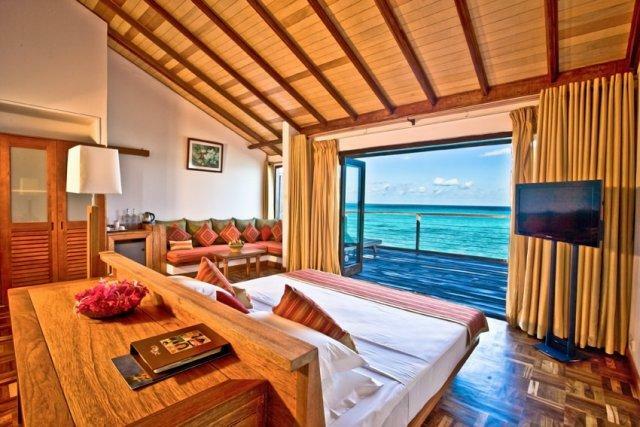 Reethi Faru Resort will offer a superior, premium stay. It is located on Raa Atoll, on the private island of Filaidhoo measuring just six hundred by three hundred and fifty meters. Not only are the villas luxe, but the philosophy of Reethi is all about conservation, so you will also have peace of mind among the thriving aquatic ecosystem. With a more casual take on luxury, the Six Senses offers simply stunning overwater villas that are also some of the largest you’ll find in the Maldives. Their approach to food is all out organic, making it absolutely delicious. Nearby experiences include great manta diving, dolphin cruises, private sandbank BBQ dinners and even exclusive surf breaks. Here’s a full review of the resort. Trace back to 2016 and you’ll find that TripAdvisor named this resort the best in the world. So what do you get in the most luxurious rooms in the world? Well, extra-size, a Robinson Crusoe feel with thatched huts, overwater hammocks and various areas to lounge around. Relax in the ecofriendly stand-alone villas while experiencing luxury at your own pace. This is hands down one of the Maldives’ most stylish and elegant resorts. The chic, modern and sleek villas will have you lapping in the luxury while you ease into the calm surroundings. If you’re looking for privacy and exclusivity, this is the place to stay. It’s possibly the Maldives’ best kept secret. 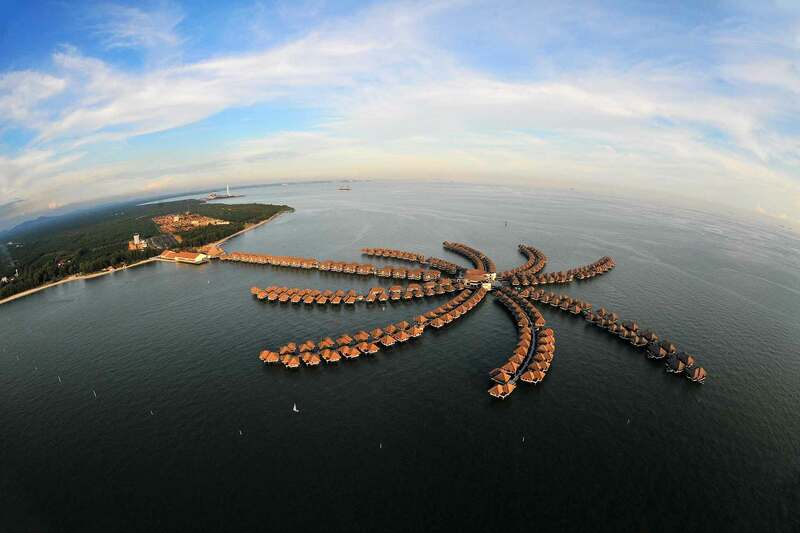 The Avani Sepang Goldcoast Resort is known to provide a more budget-friendly version of a Maldives getaway, with overwater villas and turquoise waters underneath. Unlike the Maldives resort, you won’t be able to dive directly into the waters. But you can still relax over the most beautiful azure ocean while enjoying the natural scenery and astounding sunsets. This resort offers a relaxing vacation at an affordable price. If you need a quick getaway close to Singapore, try Tioman for a perfect escape. Langkawi has it all. Hedonist beaches to party at, mangroves to explore, a cable car to the highest peaks and, of course, ultra luxurious stilted villas. 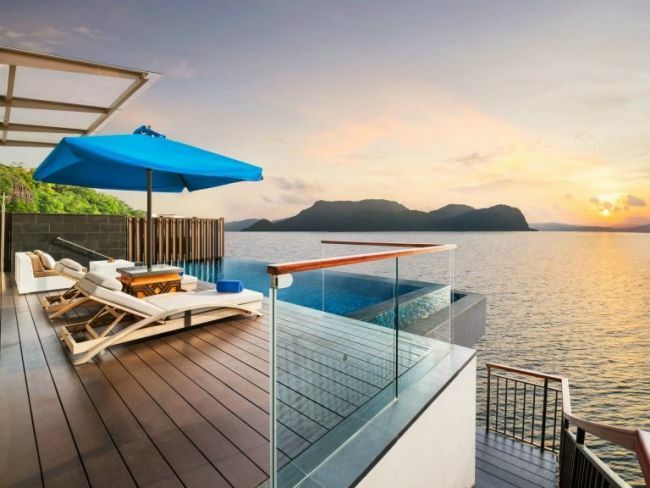 The Berjaya chain offers gorgeous over-the-ocean villas that offer undisturbed sea views from private balconies. Choose between the chalet or the suite, with the latter offering a sunken jacuzzi looking out through a ceiling to floor window. 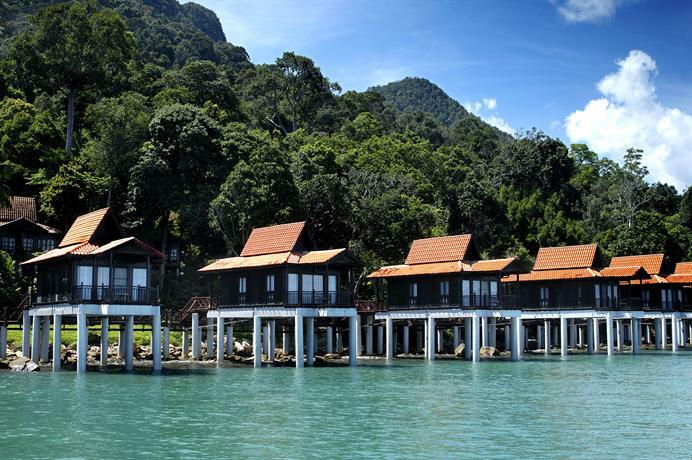 Another option to float overwater in the “Jewel of Kedah” is the opulent St Regis Langkawi. The design of the rooms are more sleek, elegant and chic than the Berjaya with more of a luxe resort feel. Pick one of the 100sqm Sunset Over-Water Villas for your own sunset-facing private pool facing over the turquoise blue lagoon. This option is perfect for honeymooners who can relax all day on their own private deck with infinity pool. 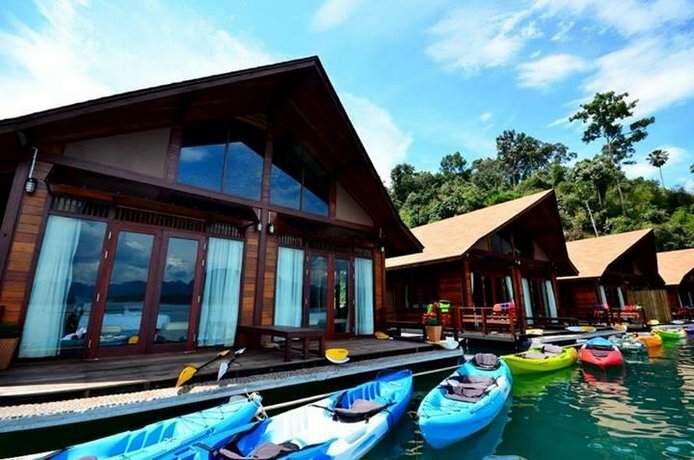 For all the best luxury hotels in Langkawi, check this post out! If you took your drone to Lexis Hibiscus and faced the camera downard, you’d notice something quite spectacular. 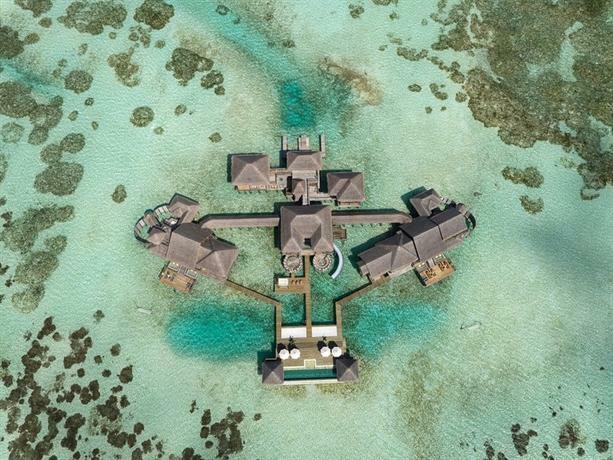 Not only are the villas overwater, they’re also laid out in the shape of a hibiscus flower! How’s that for planning. The spacious rooms are polished and contemporary, but also airy and bright due to the floor to ceiling glass windows. The beach is pristine, the view of the Straits of Malacca are divine and if you don’t want to jump into the ocean, you can take a dip in your private pool and then chill in your very own steam room. 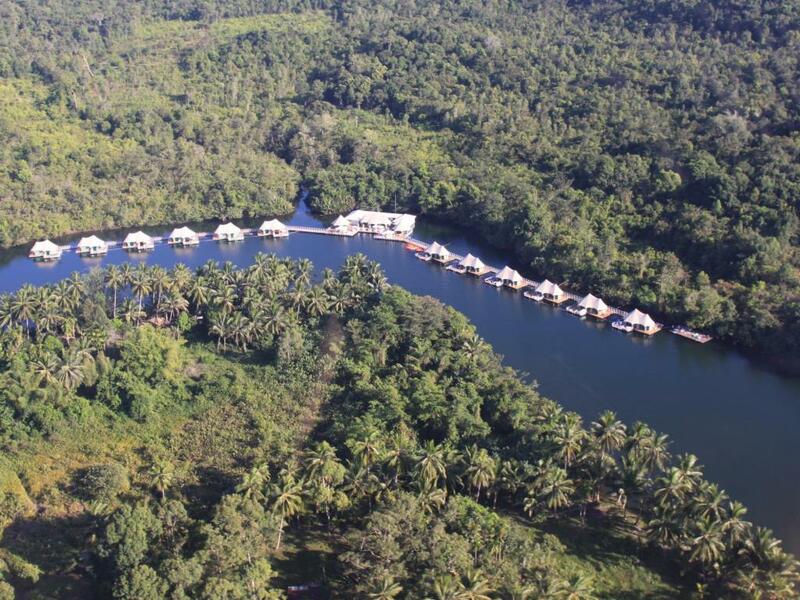 Eco-conscious travelers will be thrilled staying at Gayana Eco Resort that comes with its own marine research centre. If you take one look into the ocean from your villa window, you’ll notice a diverse marine life that is enjoying a thriving existence thanks to Gayana. Both the Bayu Villa or Palm Villa come standard with their own private decks and direct access into the ocean, with the latter boasting both a plunge pool and a bath overlooking the ocean. Pom Pom’s logo is a standing testament to what the island is all about, nature conservation in a paradisiac setting. 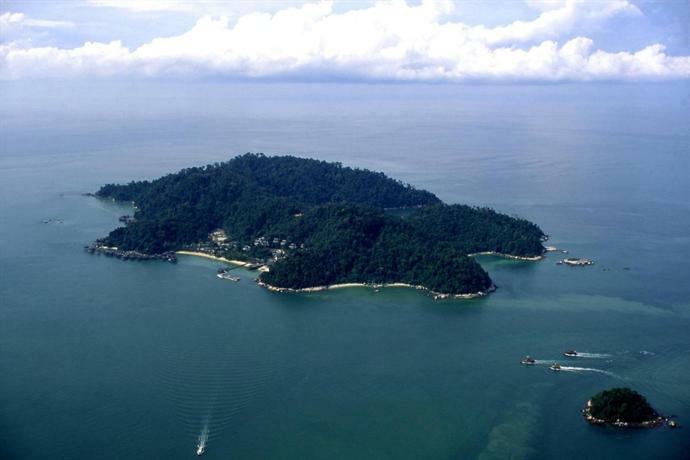 Housing one of the major turtle nesting areas and hatcheries in Malaysia, you can expect scuba diving like no other place. When you’re done frolicking with the turtles, take it easy at the Yin & Yang Spa before retiring to your gigantic room. The bathroom window is open and looks out onto the Celebes Sea for extra romance. Back in 2003 Pangkor Laut won Condé Nast’s coveted Number One in the World award as well as the Best Overseas Destination Spa category. Not much has changed in the last couple of years as the resort still offers top notch villas with superb service. When staying here you’ll witness why the late opera singer, Luciano Pavarotti, was almost moved to tears at the beauty of the surroundings. 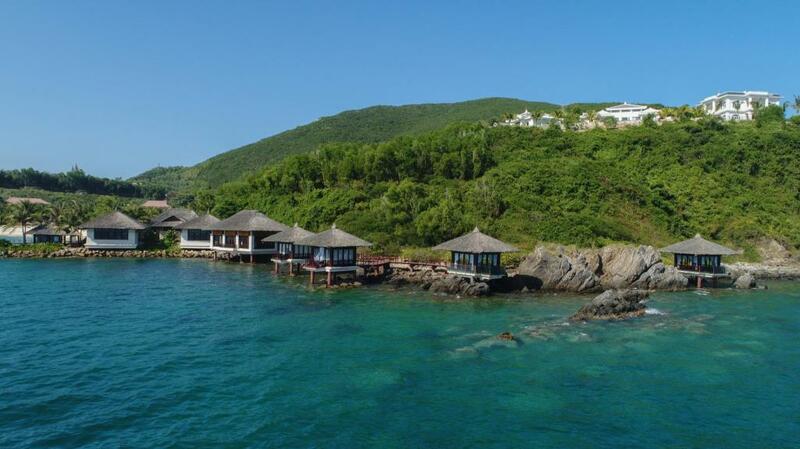 The villas are set high up on the water, among the rolling hills and nestled within lush gardens. Recline into the comfy turquoise sofas of the Avillion while breathing in the fresh ocean breeze. There are several options available for overwater villas from normal chalets to 3-bedroom 210 square meter ultimate water villas. So you can come for a pampering hen do or chill with your entire extended family. It really is a great option for families as there’s a kids’ spa and cabin to keep the young ones active while you get your own treatment. 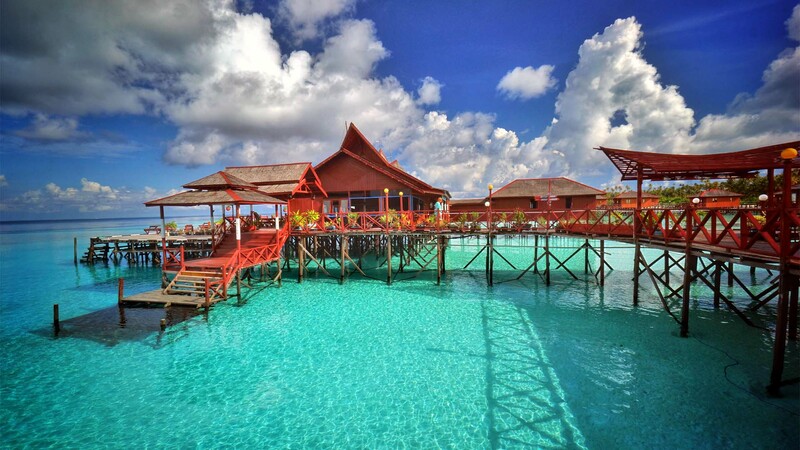 This overwater stilted village is a diver’s dream, as it’s located a boat ride away from dive meccas Sipadan and Mabul island. The resort itself boasts flourishing marine life, where you can find macro and tiny underwater life right under your villa. Spot giant moray eels, turtles and the like and then climb into bed without a boat ride. The wooden chalets are spacious and come with a private balcony to catch some rays. 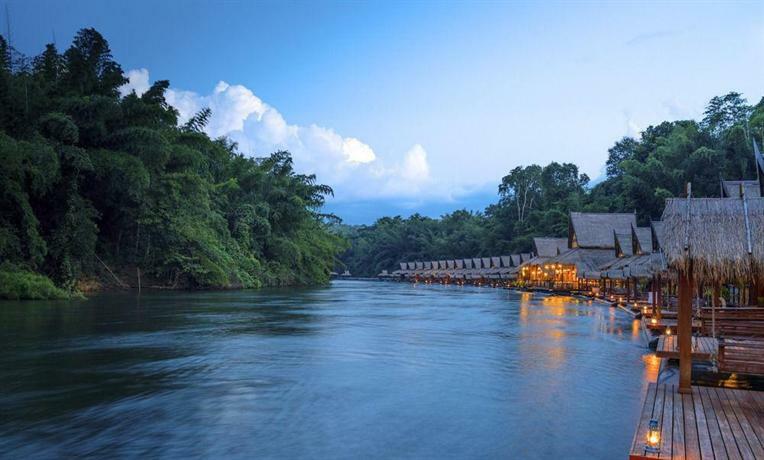 Stay along the banks of the infamous River Kwai on floating bungalows among lush greenery. The teakwood furniture and bale roofs is reminiscent local Thai folk design. Each villa comes standard with its own balcony, pier and spacious common area. You will not get closer to nature while staying on the water than at the Float House. Looking for something with a distinctive design to capture those #ood Instagram pics? Then look no further than Z9. Even the name is unique! 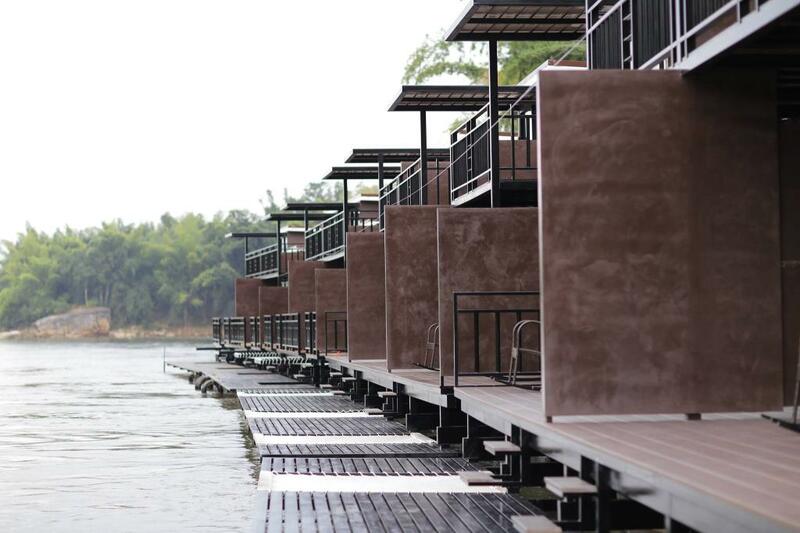 The quite luxurious riverbed suites reflect a meditative design that blend in perfectly with the calm surroundings. As there are only 15 bungalows available, you can be that the atmosphere will be one of tranquility. 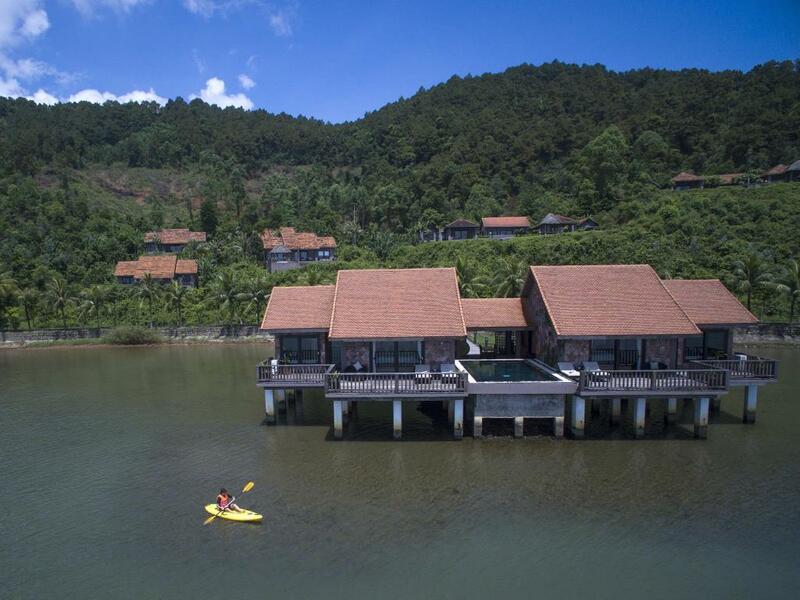 Some resorts come standard with bicycles, but have you ever heard of each room getting its own kayak? Each contemporary room at 500 Rai comes standard with its own private balcony and kayak. The emerald lagoon is tranquil and beautiful and the villas are strategically placed so that guests can watch both the sunrise and sunset. 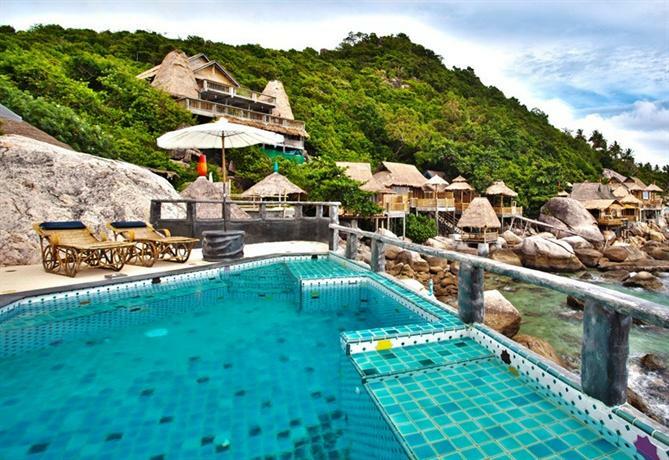 If you’re looking for both fun and tranquility, then the bamboo huts in vibey Koh Tao should be your first Thailand pick. The resort is located just close enough to the city centre, so you can enjoy the nightlife. It’s also located just far enough to take pleasure in the tranquility of the unobstructed ocean views. This is a true family vacation where your days will be jam-packed with activities. 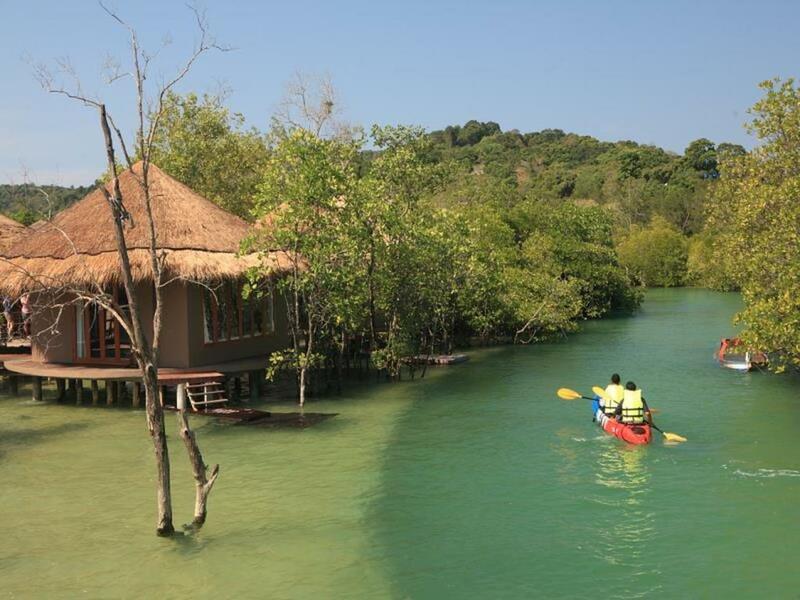 There’s canoeing, jet skiing and even an entire overwater theme park with a whole range of floatable activities. Even trampolined on a float before? Now you can! Kids and adults can take part in the kayaking or fishing competition with prizes to be won. The accommodation at Panvaree is more like a house on the water than the usual smaller villa options. Situated deep within the Khao Sok National Park, you can experience some of the best nature that Thailand has to offer. And if nature’s not enough, you can request a movie or relax in the solarium! Situated on Ko Payam Island in the Andaman Sea off the coast of Ranong, Blue Sky Resort offer their only overwater villa option. 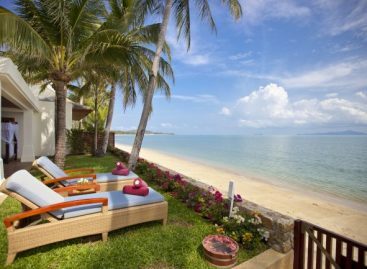 The thatch-hit villas are located steps away from the resort’s own private beach. It’s definitely a more secluded getaway, although it’s stacked with modern amenities and Wifi. Airport transfer is available too with a host of activities to enjoy from kayaking to game fishing. Kwai Tara in Sai Yok is definitely different from the typical thatched roof overwater villa. You’ll easily be struck with the modern, condo-esque double storey villas on the water. Instead of walls, you’ll find windows overlooking the pristine river. Service is impeccable at the 4-four hotel and the location makes it easily accessible to the city’s best sights. 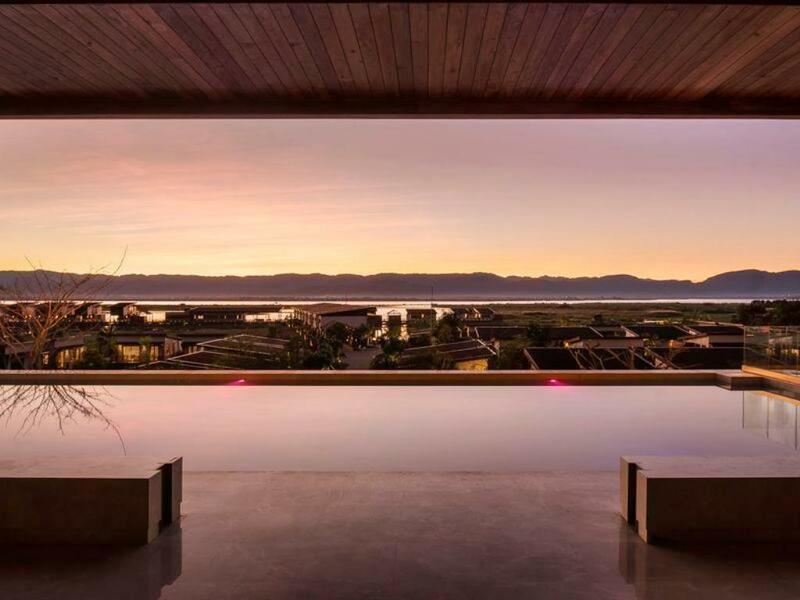 Ever wonder what it would be like to stay over water, but also on top of hill with a view? Well, now you can find out! The KC Resort & Over Water Villas in Chaweng Bay are high up on the hillside with stunning views of the Gulf of Thailand and Matlang Island. While they are not floating over natural springs, they all are surrounded by infinity pools that look something like a luxurious mote. They also have a resort on the beach if you want to be closer to the ocean. 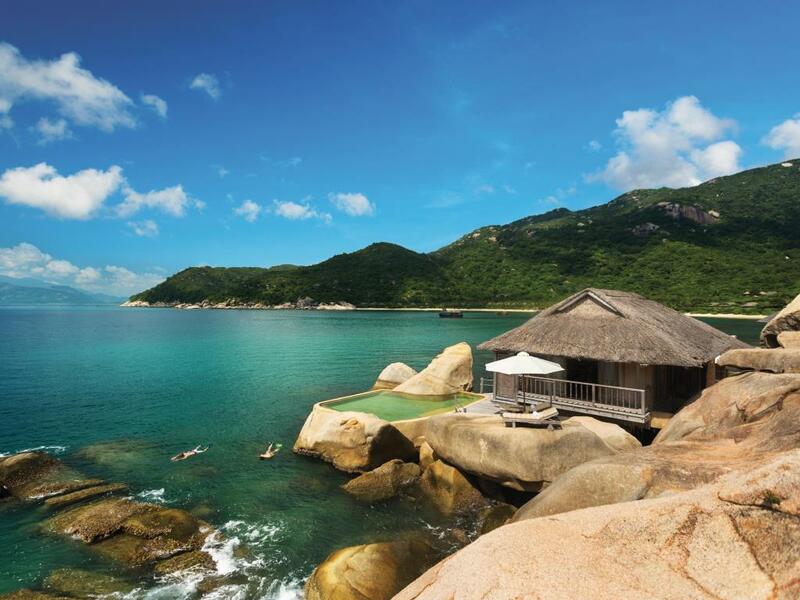 Your next getaway in Vietnam should include one of the 84 coastal villas at Vinpearl. It’s a great option for honeymooners as the picturesque beachfront views are superbly romantic. Have a massage in your overwater hut or a round of golf. Pick any of the various scents offered that will be infused into your pillow for a dreamy sleep. There are also several dining options available including an in-house bistro. A stay at any Six Senses resort will leave you feeling refreshed and reinvigorated. Yet the property at Ninh Can Bay is something entirely unique. The overwater villas are not your usual stilted hut over the water, but are rather places strategically among the rocks to give it one of the most unique images you can find. Expect the casual luxe experience of any Six Sense property with a host of activities for all ages. Another option for romance is the Vedana, situated between the ocean and lagoon in Hue, the cultural capital of Vietnam. Wake up epic surroundings of nature then join a yoga or tai chi classes. Finish your day with a personalised outdoor meal directly under the stars. There is also a large swimming pool in the main area of the expansive property. 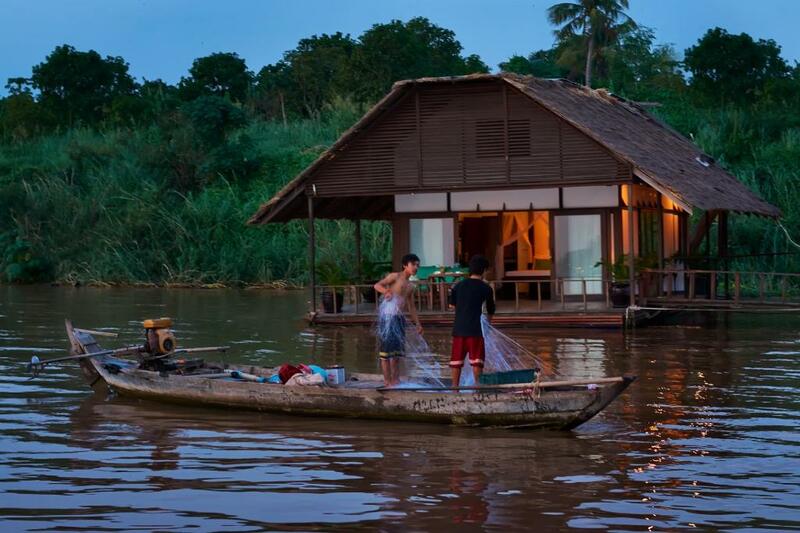 Not only is Song Saa a true reflection of Cambodia’s natural beauty, it also displays the Cambodian character of social and community development. 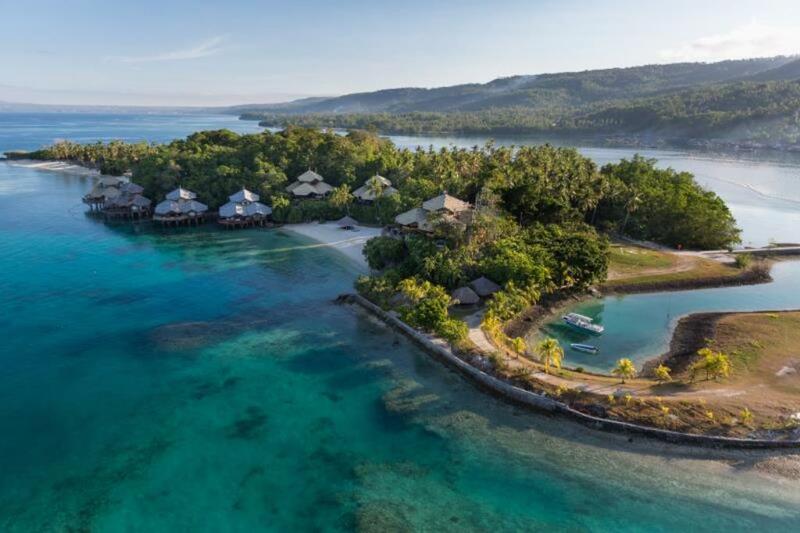 When you stay at this luxurious resort on the shores of Bawah Island you can also rest assure that The Song Saa Foundation is promoting economic development for the local community while protecting the environment. 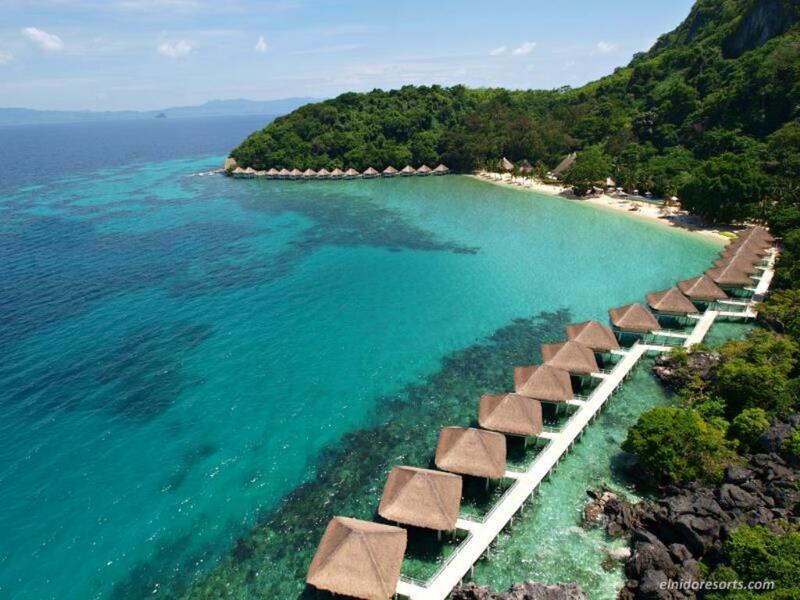 Song Saa is perfect for honeymooners, even the name which is translated to “sweethearts” will testify to this fact. Relax in the outdoor spa after some morning yoga. Stay in the spacious villas that are made from reclaimed timber and while you glide in your very own pool. You can even book the entire island all to yourself! If you’re heading to Cambodia, you might want to take a look at our Siem Reap or Wild East, or Phnom Penh guides. Here’s what to eat if you do end up in Siem Reap! 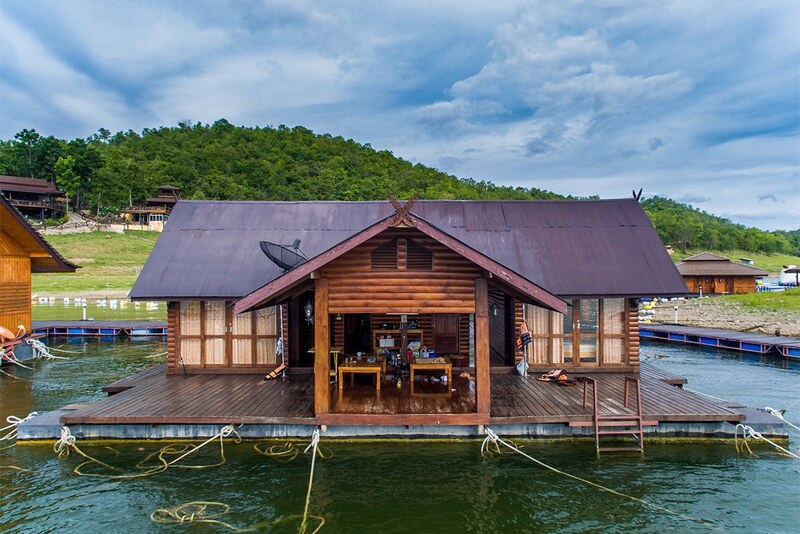 For the more active, eco-conscious travelers looking for adventure, you’ll find refuge at 4 Rivers Floating Lodge. Their philosophy is all about being environmentally friendly while providing a luxurious experience amid the lush Cardamoms Rainforest. Fall asleep bobbing above the water while listening to the epic sounds of nature. Then get up and go trekking to unexplored territory. There are waterfalls, cruises and untouched mountains to be discovered. Sister property of the Pavilion Phnom Penh, the Mekong Floating Bungalows consists of, like the name suggests, a quaint one suite floating bungalow on the Mekong river bank with views of Phnom Penh. Seclusion is the name of the game where you will be the only visitor, with a staff member for comfort and safety. You’ll fall asleep to the comforting sounds of the water and wake up to the comings and goings of the river life. It really is a break from the chaotic city life of Phnom Penh, but right by the bustling city. See our Phnom Penh itinerary here. Check Online Specials and more photos | Agoda | HotelsCombined. 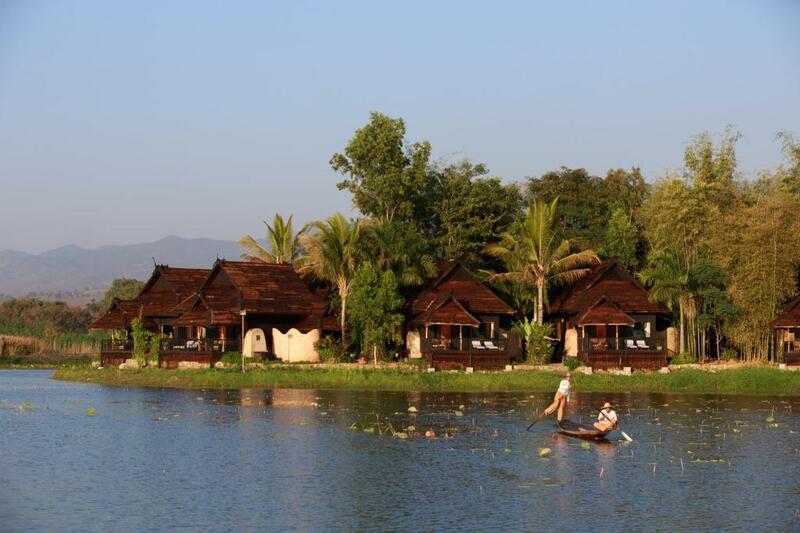 For one of the most memorable arrivals at any hotel, pick a stay at Novotel Inle Lake. You’ll be whisked away on a traditional wooden longboat and welcomed with much celebration to singing and hand shakes from the staff. There are over 100 rooms to choose from throughout the property and you can expect them all to be large and incredibly luxurious. A modern palette with Burmese undertones. And the best part of staying here? The fantastic sunsets over the serene lake. Yet another string of luxury villas floating over Myanmar’s idyllic lake setting, the Sofitel offers boutique chic surrounded by rice fields and nature. All good things come in doubles at the Sofitel with 2 restaurants, 2 bars and 2 swimming pools. Also on offer are boating excursions to the treasures of the Lake. Try the 95sqm Opera Suite with Lake views for something truly indulgent. Our last option for a floating Inle Lake stay, but by no means the least, is the Princess Resort. This time the focus is on sustainability and an awareness for the environment and the community. The result brings about locally-constructed and sustainably-sourced traditional pyinkado, teak and bamboo-thatch houses with some boasting open-air rain showers with views of the blue mountains. Take an excursion to their traditional craft market before winding down to dine on fresh, local and seasonal produce under the stars. 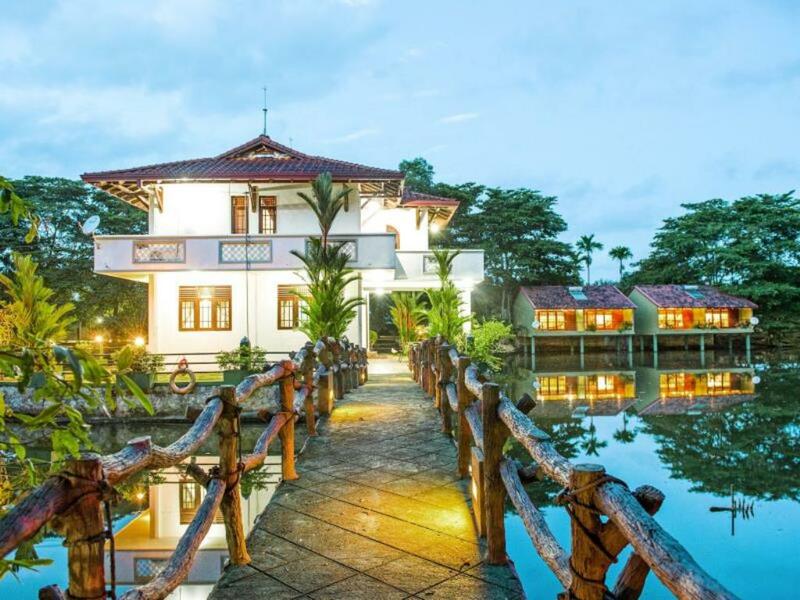 Centrally located between Colombo and Negombo on Sri Lanka’s south-western coast, Wet Water Resort is a gem just close enough to easily reach the capital city and just far enough for tranquility. Don’t let the tranquil rural setting fool you, as all rooms come standard with modern amenities. 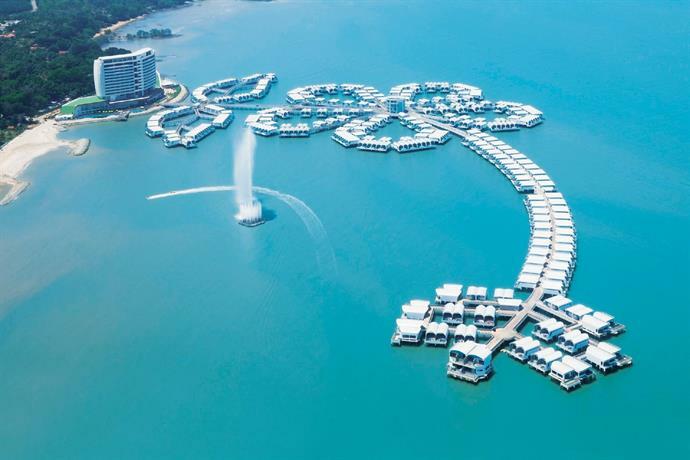 For an extra dose of over water romance, stay in the Water Bungalow, a stand-alone structure in the middle of the lake. 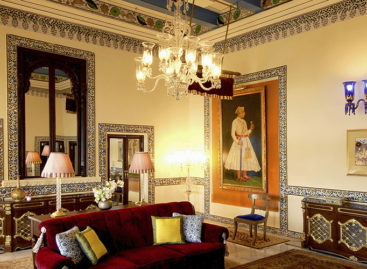 It’s like staying in a fairytale palace of your own with three air-conditioned bedrooms and a kitchenette. Here is some more Asian travel inspiration from the website.